DIY Home Staging Tips: Are You a Granite Snob? The vanity counters we're installing are resin, or so-called cultured marble, and have built-in sinks. For the kitchen counters, we shopped for granite, quartz, Corian, and laminates. I know that buyers hyperventilate over granite counters, but for homes in our price range, we decided granite amounted to over-fixing. We doubted we’d get our money back, so we chose a stone-like black laminate that Mr. Carpenter will install in the kitchen, on the pass-through counter, and in the dry bar off the living room. Frankly, I think granite is over-rated. Sure, it’ll last hundreds of years, and it’s cold and smooth and shiny, but it’s not exactly maintenance-free. 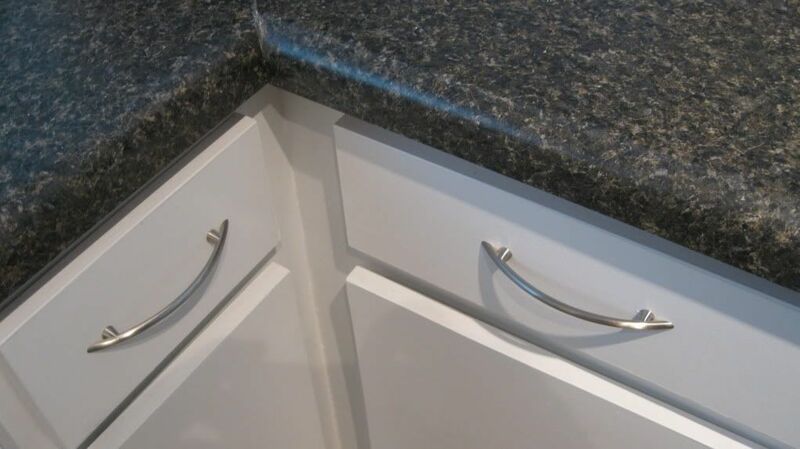 Some cleaners can compromise the sealer and dull and discolor the granite itself. In our area, hard water is a problem because it stains show in glossy surfaces like stainless and granite. With granite as countertops, if certain spills aren’t dealt with quickly, they can etch the surface. That means everyday cosmetics and toiletries like perfume and mouthwash, as well as common foods like citrus, coffee and oils, can be detrimental to your precious granite. and raised them both to a sexier 35.5-inch height. to replace the (gag) butcherblock kitchen laminate. Laminates like Formica are easy to take care of, are reasonably priced, outlive the homeowners, and come in all kinds of styles and colors. At our condo, we’re trying to put money where it will give good returns. It was easier than we thought to bring the vanities up a few inches to a trendier 35.5-inch height. Mr. Lucky removed the faucets, and then he and Mr. Carpenter eased out the old sinks and countertops. 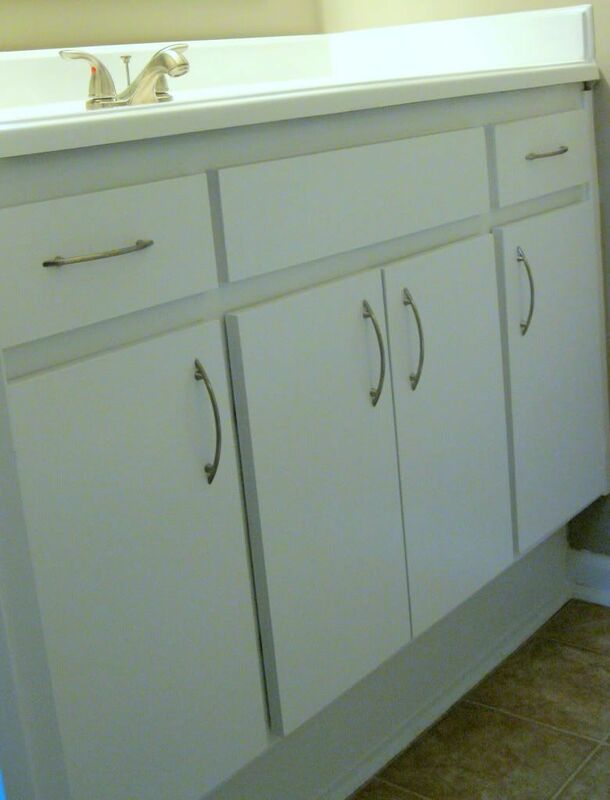 They had to enlarge the opening at the back of each vanity cabinet to accommodate the existing plumbing since it now entered the cabinet at a different level. No big deal. All it took as a 3.5-inch board at the base of each vanity, acting as a new kickplate. Then they were screwed back in place on the wall. I think this is an exciting way to get a contemporary look without replacing the whole cabinet, and all it takes is basic carpentry skills, some muscle, a little lumber, and a lick of paint. It’s worth mentioning that all the metal we pull out of the unit – old pipes, faucets, cabinet hardware, light fixtures – we are hauling to the recycle center and getting cash in return. We donated the still-good bathroom sinks to Habitat For Humanity ReStore.